DENVER, Feb. 1, 2018 /PRNewswire/ -- DaVita Kidney Care, a division of DaVita Inc. (NYSE: DVA), a leading provider of kidney care services in the United States, recognizes a national effort to raise awareness of cardiovascular disease – a condition that claims the lives of 610,000 people every year. Heart disease is common in people with chronic kidney disease, regardless of the patient's age or stage of kidney disease. DaVita Kidney Care provides a 60-second risk assessment at DaVita.com/RiskQuiz to help educate individuals about the factors that can lead to kidney disease. 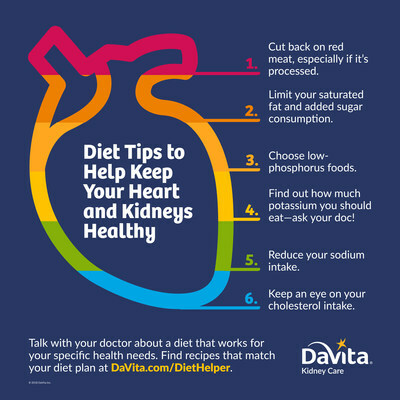 "Keeping our hearts healthy is a good strategy for maintaining kidney function and overall wellness," said Allen R. Nissenson, M.D., FACP, chief medical officer for DaVita Kidney Care. "On behalf of DaVita, I encourage you to monitor key vitals, such as blood pressure, cholesterol and sugar levels, stay active by exercising regularly and be proactive in taking charge of your health." The heart pumps oxygen and nutrient-rich blood through the arteries to vital organs, including the brain and tissues. Diabetes and high blood pressure are the two leading causes of kidney disease, which can put individuals at risk for cardiovascular disease. One in three people with diabetes and one in five individuals with high blood pressure has kidney disease. Lifestyle changes that can help reduce the risk of heart disease include exercising regularly, making dietary changes and quitting smoking. DaVita has a variety of kidney-friendly and heart-healthy recipes from slow cooker dishes to springtime favorites and smoothies at DaVita.com/Cookbook. In addition, DaVita recommends talking with a doctor to determine and manage the risk of heart disease. Follow DaVita on Twitter at @DaVita and Facebook at Facebook.com/DaVitaKidneyCare for more information and educational resources. DaVita Kidney Care is a division of DaVita Inc., a Fortune 500® company, that through its operating divisions provides a variety of health care services to patient populations throughout the United States and abroad. A leading provider of dialysis services in the United States, DaVita Kidney Care treats patients with chronic kidney failure and end stage renal disease. DaVita Kidney Care strives to improve patients' quality of life by innovating clinical care, and by offering integrated treatment plans, personalized care teams and convenient health-management services. As of September 30, 2017, DaVita Kidney Care operated or provided administrative services at 2,470 outpatient dialysis centers located in the United States serving approximately 196,000 patients. The company also operated 230 outpatient dialysis centers located in 11 countries outside the United States. DaVita Kidney Care supports numerous programs dedicated to creating positive, sustainable change in communities around the world. The company's leadership development initiatives and social responsibility efforts have been recognized by Fortune, Modern Healthcare, Newsweek and WorldBlu. For more information, please visit DaVita.com.